As you can see by the newspaper ad below, the proponent for development of the Jones Estate is coming back to council with another kick at the can to have our Urban Reserve rezoned to R-1 to make way for (at last count) 16 new homes on that 4 acre shelf. As has been discussed on numerous occasions and for a multitude of valid reasons including ground stability, water table concerns, safety and noise issues, wildlife disruption and general aesthetics and potential property value impact…GECA remains fully opposed to development of this parcel. Even if your Gleneagles home is not within view of this section of land…we are all affected in some way if the graders, cement trucks and hammers start rolling in…changing this lovely and peaceful section of land forever. 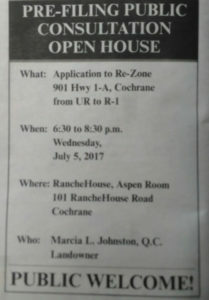 If you are able, we encourage you to visit the pre-filing consultation on July 5th at the Ranchehouse and express your disappointment over the continued push to develop this property…especially when the proponent has already noted a substantial cash offer for the land with an intention of keeping it as UR designation! That amounts, in my opinion, to an admission of pure greed with no regard for the neighbouring residents or indeed all of Gleneagles. Thankfully our current council has thus far been empathetic to our submissions and in agreement that this parcel is not suitable for development. However, this is an election year and while this current attempt may yet again be quashed before 3rd reading…a new council may be less forgiving and we encourage you to inquire about a new candidate’s position on the Jones Estate when you go to the ballot box this fall. As most of you are aware, on April 1st of this year the Town of Cochrane assumed control over the four major parks in Gleneagles…with GECA in charge of only the islands and boulevards. Almost immediately we received a series of complaints about the quality of workmanship throughout our parks, ranging from uneven cuts, to sprayed trimmings everywhere, to deep gouges in the turf caused by heavy machinery. We had a good meeting with Gerry Murphy of the Town the other day (after I exchanged several emails with Gerry and other town officials both elected and administrative) and received assurances that going forward things would improve. While our residents must understand that it will never be as polished as when we paid our own private landscaper to do things for us (i.e. the town doesn’t trim/edge along resident fence lines), we can at least expect the grass to be watered appropriately and cut evenly without big messes left behind. I am willing to cut our Town officials and contractors some slack while they work out the kinks of watering and mowing timing, and the best equipment to use in our parks. But if you continue to see shoddy results, by all means let the town know your concerns and I do trust that Gerry and Brad will do their best to rectify things. Again, we can’t expect a platinum standard of private groundskeeping, but we can expect the Town’s best. If you have issues with any of the boulevards, islands or the strip separating Gleneagles Landing from Gleneagles View…those concerns can still come to GECA directly and we will advise our maintenance contractor. SUMMER “GET TO KNOW YOUR NEIGHBOURS” GATHERING?? As indicated at the AGM and discussed briefly on the Gleneagles Blockwatch Facebook page, we have a small budget for a block party (park party) this summer for anybody who wishes to take on the task of organizing. Realistically, with it already being the end of June, I’m thinking a weekend from mid-August to mid-September would be the most likely time a couple of volunteers could put something together. If you have some time this summer and are looking for a great way to get involved and give back to the community by organizing a Sunday BBQ, let me know and we can help out with the costs of food, soft-drinks and maybe a bouncy castle or two for the kids.